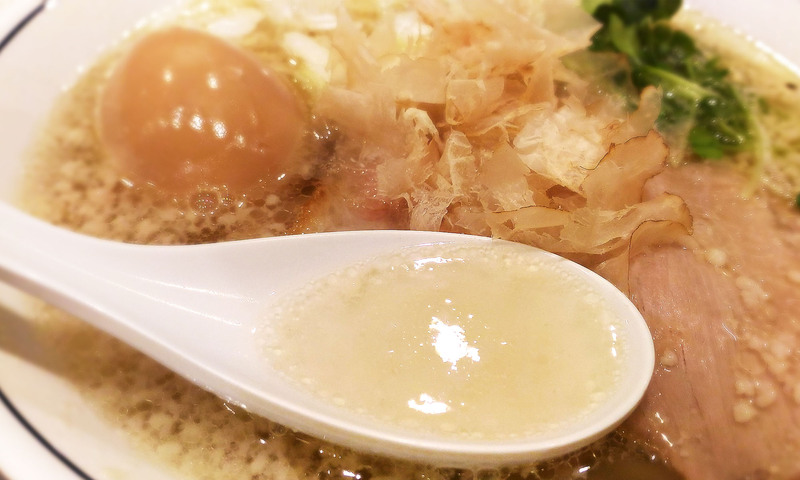 Shio literally means salt, but shio ramen is not salty ramen. A pinch of shio serves as a catalyst to maximize the flavor of our special broth. Shio ramen with Ajitama, seasoned boiled egg, and a few slices of Chashu. Pork lovers’ delight. Enjoy the seven thin slices of Chashu that cover the noodle. Our chashu is often described as “stewed pork” or “thinly sliced pork”, but it does not tell it all. Come and enjoy the rich flavor and indulgent texture of chashu topped on our ramen. YuzuKosho is a type of seasoning which is made of Yuzu citrus and green chili (kosho generally means pepper but in this case it means green chili for some reasons) and matured. You’ll find it in a small bottle on the table. Add a bit of our selected flavorful YuzuKosho to your Shio ramen. Caution: it is hot. What is Tamari-shoyu? It’s black! DON’T BE AFRAID OF THE COLOR! Shoyu is soy sauce, but our tamari-shoyu is something different; it is more flavorful and not as salty as it may look. Please season it to taste with vinegar. Tamari shoyu ramen with Ajitama, seasoned boiled egg, and a few slices of Chashu. What’s the stuff on top? That’s what we call is Toribushi. If you are familiar with Japanese food, you might think of Katsuobushi, which is known as bonito flakes. Tori (鶏) means chicken. Toribushi is made of chicken, with the traditional technique of making Katsuobushi. It adds a tasty flavor to our ramen. [Soup noodle] – [soup] = ? Ramen is often described as “soup noodle” but it can be soupless to be ramen. Enjoy our spicy soupless ramen. It is not only mildly hot but also tasty. Karai means spicy hot. A-e-ru means mixing. Mix all the toppings and on-tama, soft boiled egg, with our special spicy sauce. Make any ramen a combo with half-size fried rice, Yakimeshi. Yaki means fried, and meshi generally means cooked rice. Chao Fan is Chinese fried rice, and we call our fried rice Yakimeshi, which is Japanese style.